Trolls have been around world legends for as long as we can remember. They are presented in folklore as evil little creatures making all sorts of messes with man around the world. But there is one little troll who bounces from this rule and has a much different reputation. His name is Hugo and he came to life in the 1990s when he became the star character of a Scandinavian TV show. Many of you may not remember the show, but Hugo continued his TV career making appearances in many other shows worldwide. Luckily his temper didn’t change over the years so he’s still one of the good guys. Being good does pay off so he’s kindness made its way to the new video slot game that carries his name, Hugo. The story of the game is well known. He once again sets out on a quest to rescue the love of his life, the fair Hugoline, from a cage deep underground in the goldmines run by witch Afskylia. His mission is dangerous as Don Croco is on the lookout and this is one angry crock you don’t wanna run into a dark mine shaft. Apparently one of the designers at Play N’ Go loved Hugo’s appearance on the TV show and decided to pay tribute to his brave actions by creating this video slot game. The game is designed in a well known Play N’ Go pattern, with great attention paid to the visual effects and the bonus features. With this game Play N’ Go continues the tradition of creating top of the line video slot games which will surely attract many players around the world. Like many of the new Play N’ Go releases Hugo has only 10 active pay lines which go over 5 reels and 3 rows. The pay line number can be adjusted from 1 to 10 and the bet levels with all 10 pay lines active range from $0.10 to $100 per spin. The bet is adjusted by using the Coins Number button, 1-5, and the Coin Size button, 0,01-2. Once the bet is set players can use the auto play option for spinning 50 times in auto mode. The bonus features in Hugo are a real treat for a gamblers eye. 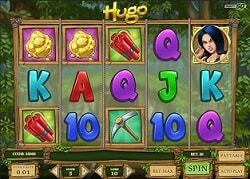 Players can trigger the Gold Mine Treasure bonus or the Hugo free spins bonus feature. Both of these features can produce big payouts, but the free spins are always a bit more attractive. They are triggered by landing 3 or more scatters on the reels and the player is taken to a separate screen where he has to choose between Don Croco, Hugo or Afskylia. They all award different prizes in free spins and extra scatter payouts. Don Croco will award you with 15 free spins and 1x bet extra scatter payout, Hugo will award 10 free spins with 2x bet extra scatter payout and Afskylia will award only 5 free spins but with a 3x bet payout for the extra scatter symbol. The extra scatter symbol during the free spins is the fair Hugoline and you need at least one on the reels to win the extra scatter payout attached. But she can also come stacked across all reels and award some really generous payouts in each free spin. Also landing another 3 scatters during the bonus round will re-trigger the feature. The Gold Mine Treasure bonus is triggered with 3 Golden Treasure chests on the reels and Hugo takes a trip down the gold mine. One door is picked among the ones offered awarding coin prizes and eventual access to the Treasure chamber. But finding Don Croco behind the door will send you blasting out of the gold mine and the bonus round ends. The maximum promoted payout in Hugo is set at 100,000 coins or a great 10,000 x total bet. This is a payout well worth chasing, making Hugo an attractive video slot game to play. Hugo is the latest Play N’ Go video slot game we had a chance to see and try for real play. It has everything we can ask for in a game. Great animations, funny symbols and game theme, with some serious payout potential in the bonus features. Like all new Play N’ Go slot games we are sure Hugo will be a big success in the online gambling community.